...butterfly wings flutter, as a soft breeze wafts through, whizzing: listen. Lightnings crack, thunders roar, as ravens cry in flight, cawing: listen, listen, take notice. Where the ‘baji’ artists break their silence, canvases are stretched out and slathered with colors, brushes gliding through, deliberately scraping: look, listen, take action. Some of the Baji artists present during the exhibit opening pose with guests Dr. Carrie Tharan and Madame Enriqueta Butalid. 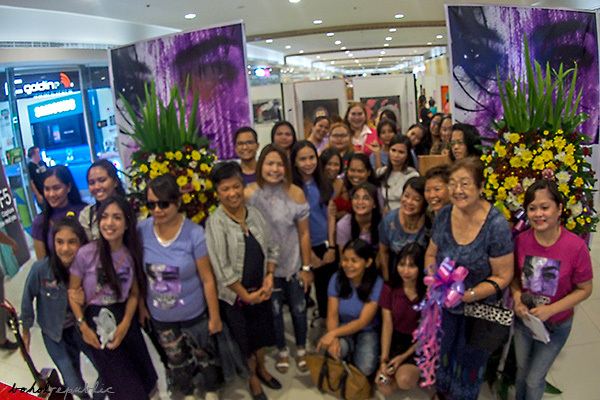 The Baji Arts Collective is saying exactly those, this time, purposively, as the group unveiled its annual women’s month visual and literary arts exhibit aptly themed “Breaking the Silence” last Sunday, 4th of March at the Island City Mall. In solidarity with the global movement (#MeToo #TimeIsUp) against misogyny and gender-based harassment, violence, and exploitation, this year’s Baji Exhibit features an eclectic crop of 57 paintings (in watercolor, oil, acrylic, and mixed media), 4 illustrations, 3 photography series, 2 installation arts, 2 sculptures, 1 furniture, 2 embroidery art, 9 poems, 2 balak’s, and 1 flash fiction – by 47 exhibiting visual and literary artists, 3 sets of whom are blood sisters, with 3 mother-daughter pairs and one US-based artist. 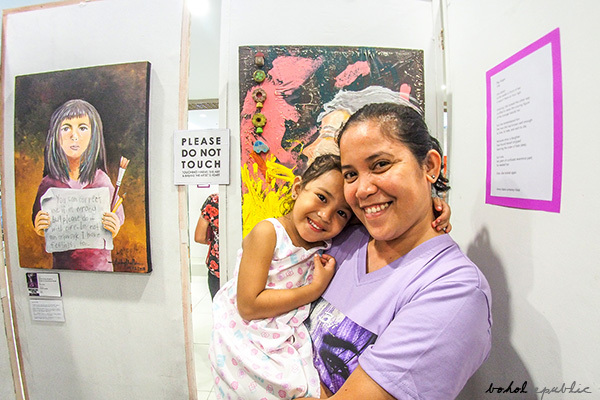 Baji coordinator, Jhacky Curambao-Aballe and her 4-year-old daughter Jamel “Langga” Aballe collaborated on the two paintings behind them: “The Artist” (mixed media, 18x24 inches) and “Trails from the Past” (mixed media, 20x24 inches). Baji artists are your everyday women: daughters, sisters, mothers, titas, grandmothers. Only a few consider themselves professional artists; most are doctors, nurses, entrepreneurs, environmental scientists, lawyers, educators, academics, designers, development workers, students, all Boholanas, with a passion for the arts and have braved to bare their souls and showcase their works of art – really, their fears, passions, angsts, truths, and their strengths – out in the open. 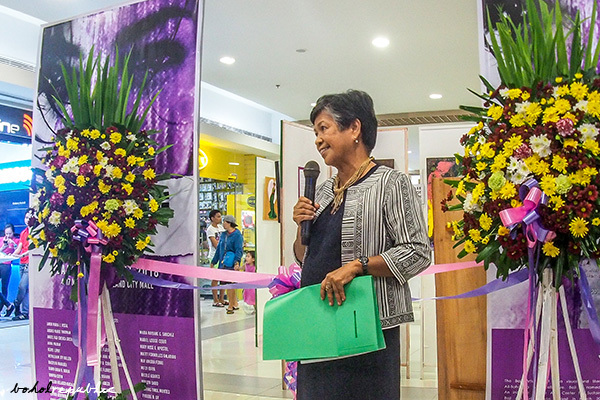 Dr. Carrie Tharan, Ph.D., retired Dean of the College of International, Humanitarian & Development (CIHDS) Studies, Miriam College and a women’s and gender studies scholar, during her inspired and inspiring speech at the exhibit opening, said that breaking one’s silence, in as much as it is empowering, also burns – but the kind that cures. She offered that, in silence-breaking, surrounding one’s self with a strong circle of support is important, especially in moving forward and following through with the next steps in seeking restitution, claiming justice, healing. Although the “silence” broken by the Baji 2018 runs the gamut, and are either metaphoric or explicit, ironic or straightforward, muted or vivid, bashful or unapologetic, biographical or impersonal, there are works that are courageously confessional, one can’t help but look – and listen. 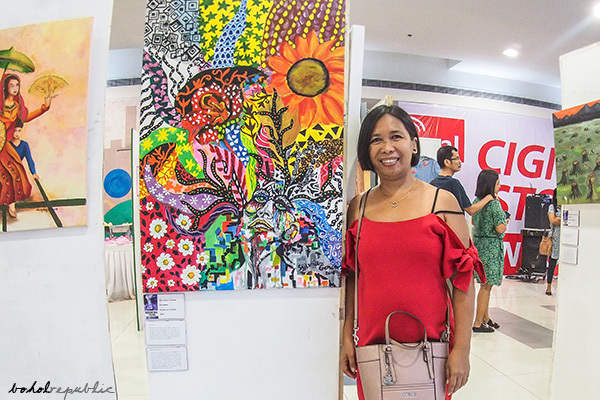 This year's exhibiting artists are Amor Maria J. Vistal and sister Fides Maria J. Vistal, Andrei Marie Thurman and mother Gladys Gallentes, Angel Hao Cuenca Socias, Anna Palban, Beryl Lupot, Bethlehem Joy Bullen, Cynthia Logarta Bompat, Daisylou Manluza, Dawn Likha B. Borja and sister Maia Binhi B. Borja, sisters Dby Kastel Cabagnot Saco, Dea Tsina Cabagnot Saco, Dyza Bianca Cabagnot Saco, Dimpna Cutin, Edeliza Velasco Macalandag, Elva D. Evasco-Auza, Esther Gertrude Biliran, Gay Ido Bernaldez, Gisela Asares and daughter Nicole Asares, Jammy Ungab, Jasmine Fleur Joaquin, Jessica Jane Bernasor, Jhacky D. Curambao-Aballe and daughter Jamel Eunice Aballe, Joanne Flores, Karyl Ogario, Kins Aparece, Liza Migriño Quirog, Lumin Tirol Pamaran and sister Nuevas Tirol Montes, Ma. Julie Bee A. Unlayao, Ma. Sylvia Gonser, Maria Rayjane C. Sanchez, Mariel Louise Cerio, Mary Rose E. Apostol, Matet Fornolles Galarido, May Amora Ferre, Mitzi Ibaya, Noelyn Dano. 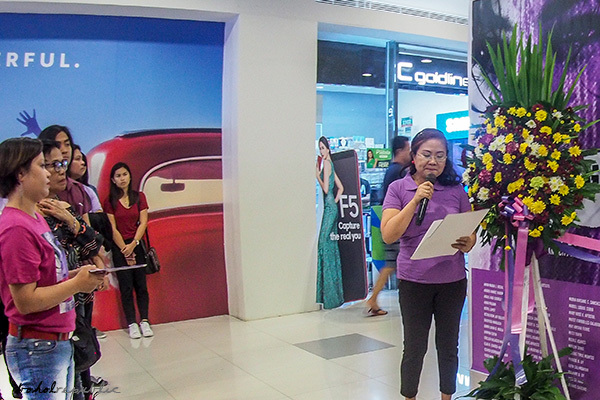 Vida May O. Tirol-de Juan, Ph.D. hosted the exhibit opening program. 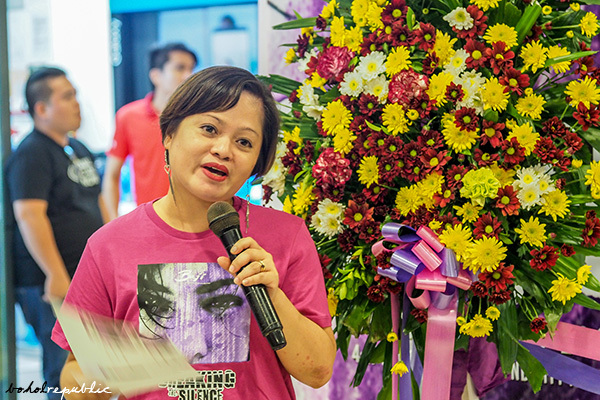 Liza Migriño Quirog, Executive Assistant of the Governor of the Province of Bohol and a Baji 2018 exhibiting artist herself, also gave a powerful speech in support of women silence-breakers. 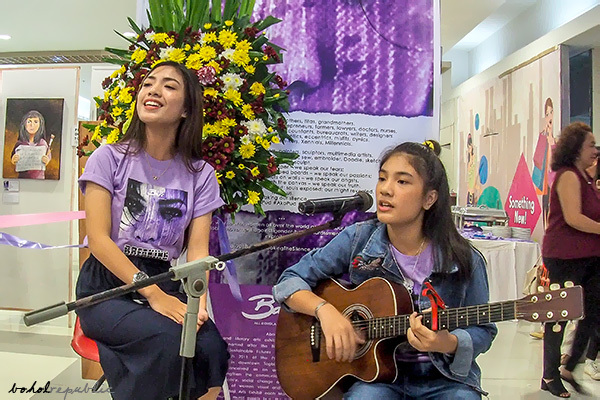 Julia Faith Joaquin and younger sister, Fiona, serenaded the crowd with stirring and uplifting songs. Their sister, Jasmine Fleur, is an exhibiting artist, displaying her photography. 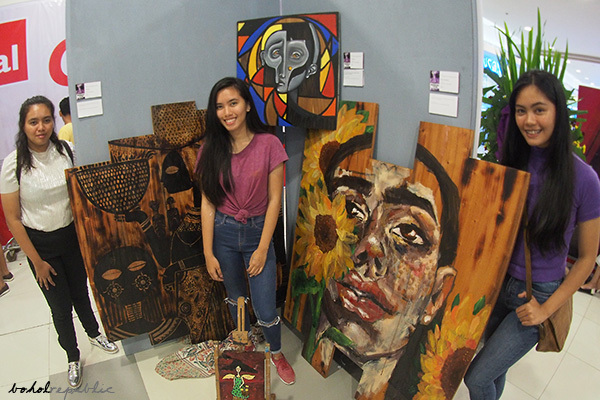 The Cabagnot Saco sisters Dea, Dby and Dyza show off their larger than life acrylic paintings on mahogany entitled “Vroue” (150x150cm), “Abuhun”, and “Bud Naked” (150x150cm), respectively. Ma. Sylvia Gonser is a businesswoman but feverishly paints on the said. She stands beside her “Boundless” (acrylic on canvas, 24x36 inches). 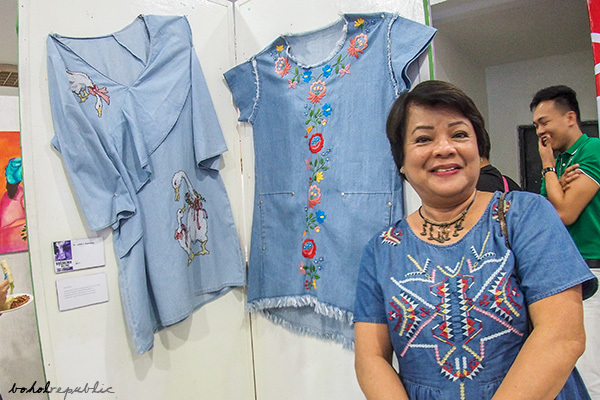 Lumin Tirol Pamaran, Ph.D., Vice President for Academic Affairs of the University of Bohol, shows off her intricate embroidery art on denim. The Bohol Climate Walkers are Baji artists, too. 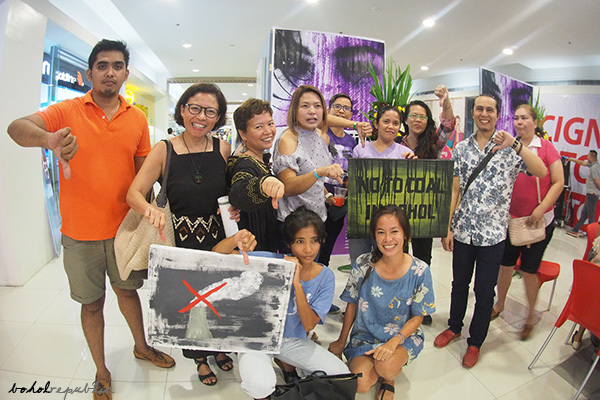 Here, they pose with two Baji 2018 artworks protesting the entry of coal in Bohol. The Baji Arts Exhibit is a visual and literary arts exhibit staged every women's month each year by the Baji All-Boholana Arts Collective. Baji is named after the Binol-anong Binisaya word for woman: babaye, bayi, baji. 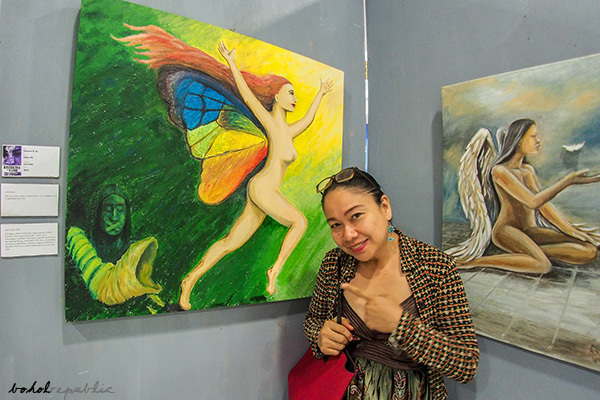 An initiative of the Asia Center for Sustainable Futures (ACSF), a local research and advocacy institute, the first Baji Arts Exhibit was staged in March 2011 at the Photographic Museum and Archive of Boholano Life and Culture of the Holy Name University in downtown Tagbilaran. The concept of providing Boholanas public space for their creative expression was conceived as an advocacy project after an international young feminists training event which sought to strengthen the communication capacity of grassroots women to effectively use media and communications for advocacy, social change and women’s rights. Since then, the Baji Arts Collective has become a stand-alone sisterhood of women visual and literary artists who have since taken on the task of coordinating and curating the annual Baji Arts Exhibit each March. Baji also regularly reaches out to the community through the arts, notably via community mural events (e.g. the DCPNHS “dolphins and friends” mural) and art sessions with vulnerable sectors. They regularly meet for artjammings and are active in the Bohol arts and culture scene. The Baji Arts Exhibit and the Baji Arts Collective is open to all Boholana women artists looking to share and showcase their creative selves to fellow women artists and the public.